The library is closing up for Friday, July 4th so that everyone can get out and enjoy Independence Day however they see fit, whether they are going to watch some fireworks, have bonfires with friends, or enjoy lots and lots of home-grilled food. But how were folks celebrating in Michigan 228 years ago? It was the year of 1876, the Centennial Anniversary of American Independence. It just so happens that the Clarke has the Centennial Celebration programs for Grand Rapids and Kalamazoo. 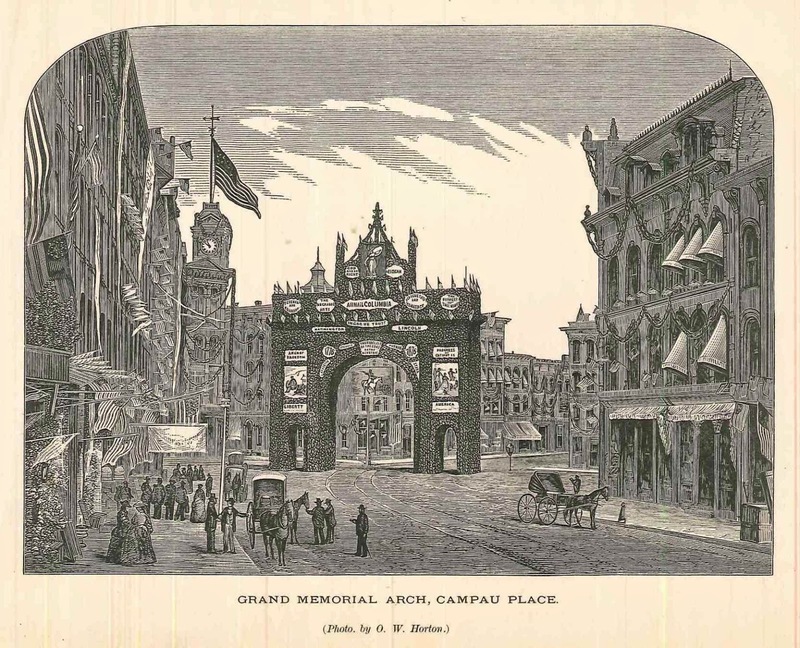 Grand Rapids was busy and thriving, just having built the Grand Memorial Arch at Campau Place specifically for this momentous occasion. The arch was designed by Col. Joseph Penney and erected by Mr. C. H. Gifford. It was said to be “without doubt one of the finest ever erected on the continent and unrivaled by any other city on this centennial day.” But would Kalamazoo agree? “The Terrace Chariot, bearing Miss Frances Little as ‘The Goddess of Liberty,’ around whom were gracefully grouped thirty-seven young ladies, representing the States, was the finest thing of the kind ever seen in Kalamazoo, and elicited admiration and applause at all points on the line of march.” It truly must have been an incredible site to see, and an event not to be missed. We aren’t sure how it would stand up against the Centennial arch, however. 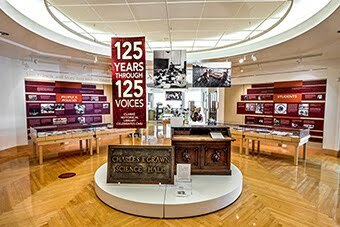 If we could, we would share with you the magic of the entire Kalamazoo Independence Day oration, but it lasts about 70 pages, so if you are interested—should we say so inspired--we might suggest you make a visit to the Clarke Library. We invite you to come to the Clarke Historical Library and to take a closer look—by way of these two slender volumes—at how the centennial of the Fourth of July was celebrated in two Michigan cities.